Whether you’re from Delhi or in town visiting for a few days, there’s nothing quite like a luxurious stay to really pamper yourself. Though staying in 5-star hotels cost an arm and a leg, it’s alright to treat ‘yo self once in a while. We’ve put together a list of the best luxury hotels Gurgaon has to offer. Go, take a pick. The Leela never disappoints. It’s all things fancy and you can feel it as soon as you set foot inside this spacious hotel. With more than 200 premier and deluxe rooms, the amazing spa by Pevonia (block out some time for this). Food-wise, you have ample options to indulge in. Try Spectra, a massive restaurant with seven different cuisines. They also have Zanotta for amazing Italian food and Diya for North Indian. Treat yourself to some cocktails at either the pretty Skydeck Lounge or Rubicon Bar & Cigar Lounge. Don’t leave without dessert from The Leela Patisserie. Just, don’t. Barely 40 minutes away from the corporate hangout that Cyberhub is, the Westin Resort Sohna And Spa is heaven for the weary soul. It’s a stunning property that will make it hard to leave. The resort boasts of gorgeous single villa rooms, lush gardens, a spa and a pool. Now this is just the staycation you need. Plus, the bar has some killer cocktails. Just what you need when you’re relaxing by the pool. Who doesn’t want to stay in a hotel where you can dine on a floating deck? Despite being in Gurgaon, the hotel has a lot of open spaces and of course, their luxury rooms are a real treat to stay in (just look at that view). The spa therapy in the hotel is absolute bliss and we hear the signature Oberoi dhara promotes calmness and wellbeing. Treat yourself to a delectable meal at Amaranta with regional delicacies (the head chef Tejas leads a brilliant team with six different regional heads) which you can wash down with their fabulous cocktails. If you’re staying in this hotel as a part of your business trip, don’t be all work and no play. It’s one of the best business hotels to stay at. With floor-to-ceiling glass windows that offer a view of their gorgeous pool outside and their outdoor seating area, it’s easy to forget you’re actually in the heart of the city. They have a fitness centre, spa and some fantastic restaurants to eat at. Gorge on authentic Thai food at the Thai Pavilion. Alfresco, on the other hand has Continental, Indian and Pan Asian grilled food that you can eat outdoors. They’re linked to Tease, a bar that will make you forget all about your work stress. Deli 4 is where to head for coffee and fresh cakes. Latitude does European, Mediterranean and Asian food. More than enough options… Wouldn’t you say? Fancy staycation, anyone? Le Meridien Gurgaon is just where to go for a special anniversary or bachelorette. They’ll leave you spoilt rotten. With excellent room service that will cater to every possible need you could have and more. They have a lovely pool to unwind and the Senses Spa has an incredible Balinese massage your cramped muscles will appreciate. Head to Bella Cucina for stellar Italian delicacies. Latest Recipe is their other restaurant where the buffet is a melange of Japanese, Mediterranean and regional Indian delicacies. Of course, special mention goes to their Longitude Bar. Keep the cocktails coming, please. You’re on vacation, after all. We’re sure you must’ve been here for weddings and meetings, but if you ever find yourself looking for a five-star hotel in Gurgaon, the Hyatt Regency more than meets expectations. Apart from their stunning rooms that are hard to get out of, try their super swanky fitness centre or go for a swim in their open-air swimming pool. Go in for a spa session at the in-house Shvasa Spa. Dig into a world of Awadhi goodness at their restaurant, Lavana. With stunning views and even better dishes, it will definitely be a meal to remember. 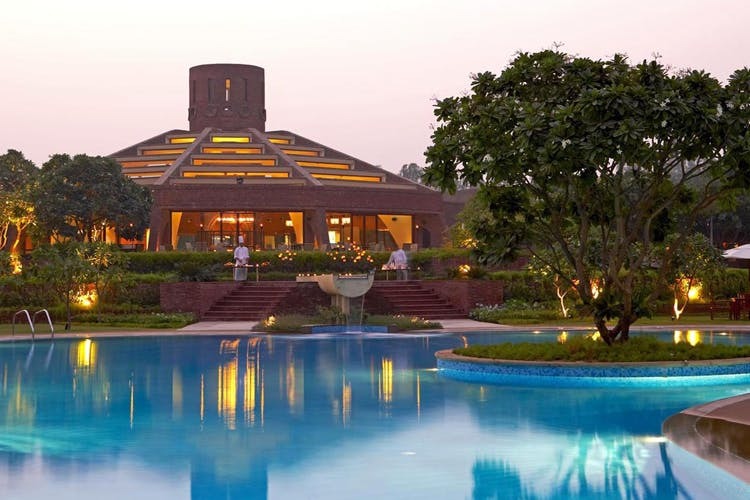 The Trident in Gurgaon gives you a resort-like feel as soon as you enter. Apart from housing the famous restaurant Cilantro, known for its delightful Sunday brunch and wood-fried pizzas, The Trident is known for its stunning Moroccan, Mughal and Rajasthani style architecture. With massive domes and open, airy spaces, reflection pools and palm courtyards, your stay will be noting short of splendid. Their 136 rooms are all gorgeous, the pool is heavenly and you can relax at the Trident Spa before you hit either Cilantro, The Saffron or the Japanese restaurant (our personal favourite), Konomi.